End Grain Cutting Boards features the end pieces of wood rails approximately 1-1/2" x 1-3/4" that are glued together into a traditional square pattern. During cutting or chopping, the end grain wood fibers absorb the impact of the knife blade, allowing you. We now offer Butcher Block Oil - (Amazon # B01M9IB9B5) and Butcher Block Conditioner (Amazon # B01M34XW9K) Copy and Paste these item numbers in the Amazon search bar to order. They will keep your new block looking Great and Working for years. If you have any questions about this product by Top Chop Butcher Block, contact us by completing and submitting the form below. If you are looking for a specif part number, please include it with your message. 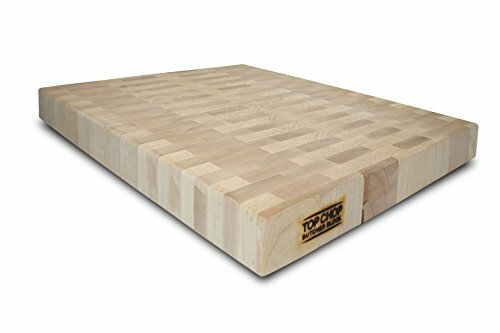 Top Chop Butcher Block Reversible End Grain with Blonde Stripe Cutting Board, Walnut, 24" x 18" x 2"